If trees are the elders of the countryside, then the bees are part of the summer pageantry of a fairground, here in numbers for just six months of the year they work hard and play hard, getting drunk on nectar whilst setting themselves up for the long winter ahead. The first bees of the year for me, appeared on valentines day a whole month before I saw the next. These were the honey bees on the gorse flowers, just a stones throw from the edge of the residential in Grantham. I would expect these were from a hive somewhere in a garden nearby. The footpath here winds through the gorse shrubs, creating a sheltered microclimate filled with the coconut-scent of the flowers making an ideal first-forage of the season! This beautiful little bee is the first mining bee I saw in 2017. This was taken at Farndon Willow Holt – a Nottinghamshire Wildlife Trust reserve which is best known for its collection of willows but with many other habitats besides. This little male mining bee was on a blackthorn flower against the blue spring sky in March. 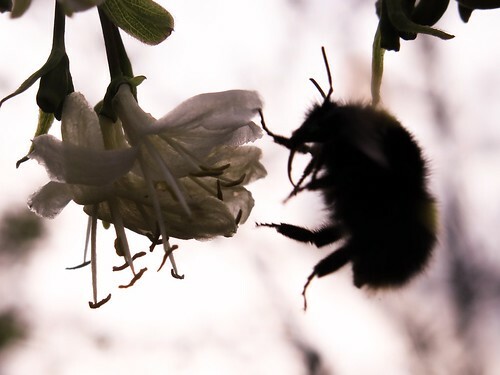 This is the aptly named ‘early’ bumblebee – visiting winter-flowering honeysuckle in my parents’ garden back in March. Ornamental and garden plants such as this can really extend the range of nectar sources available for early-flying bumbleebee queens in the springtime. This little bee appeared on the inside of our new greenhouse as we were assembling it over easter. The structure was only half-glazed at this point and upon flying in, it must have flown upwards and become trapped in the glass roof. After a few photos, I sent it on its way! These grey and black mining bees are very striking, and often the first ‘unusual’ bees which people notice in their gardens before discovering the world of different bees which their flowers support. 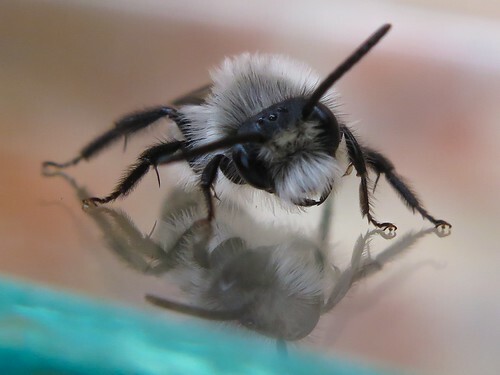 This was one of the first mining bees I ever took real notice of – it was searching for its hole next to me in the garden and I was struck my the beautiful patterning of the fur. This shot was taken in a spot I came to think of as ‘bee alley’ – just around the corner from work it has a good patch of green alkanet – an early flowering member of the forget-me-not family – and the aspect catches the sun at lunchtime resulting in a new species pretty much every day I visited! Read more about the bees I saw there on this page. The Drift is an ancient track which runs along the Lincolnshire/Leicestershire county boundary near us. 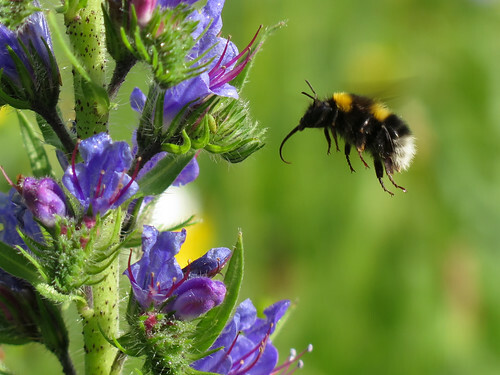 The limestone grassland is filled with wildflowers but the key species for bumblebees is always the viper’s bugloss – it produces nectar-rich flowers which are accessible to a range of the ‘generalist’ bumblebees and will keep on producing more week after week. If you want to boost the bee-value of your garden – this would be my top tip! 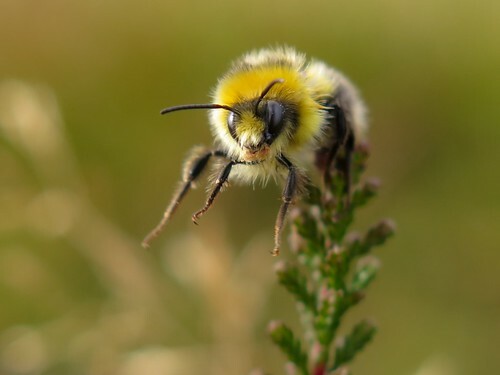 The house next door to us had a tree bumblebee nest this year and one day, the garden was filled with the tandem flights of newly emerged queens and sharp-eyed males who had latched on to mate with them. It was amazing to watch the queens successfully take off with such an extra weight on their backs! You can see in this photograph how much smaller the male bumblebees are compared with the queens. 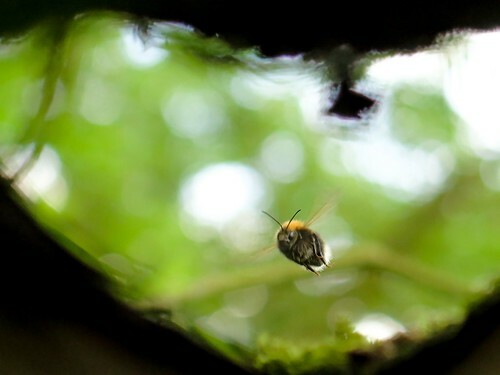 This was a photo of a tree bumblebee arriving into its nest in a fallen willow. The nest was in a failed hazard beam meaning the cavity opened on both sides with the nest situated in the cavity above. By positioning myself on the opposite side, I managed to get this shot of a worker approaching and about to enter the nest. 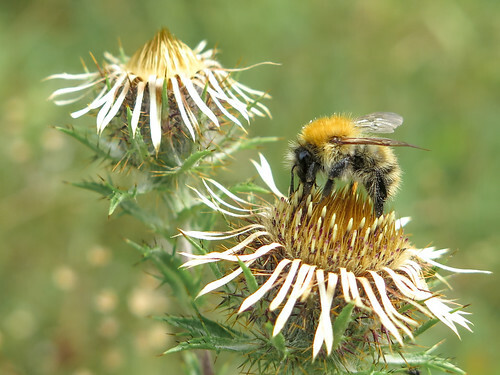 This was another photograph taken along The Drift – this time of a bumblebee which had spent the night on a knapweed flower and had not yet warmed and woken up. 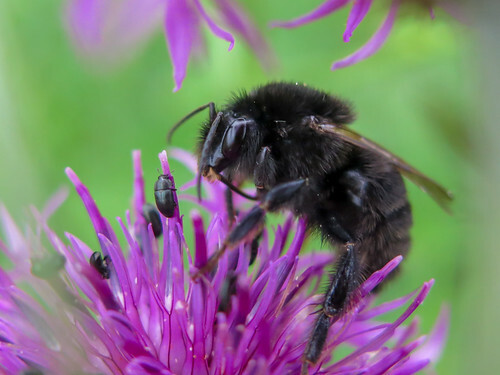 This was one of several individuals which were all black – a melanic version of the ruderal bumblebee which is typically banded. 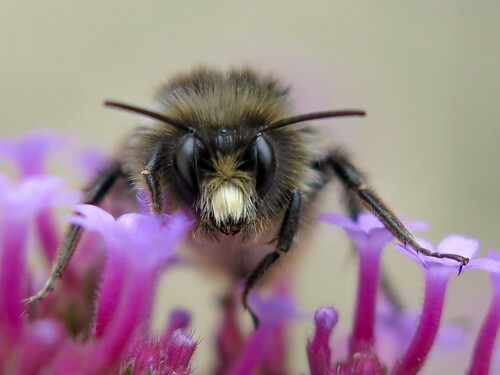 This species of bumblebee is thought to be on the increase – possible reasons could include climate change or the increased planting of red clover. 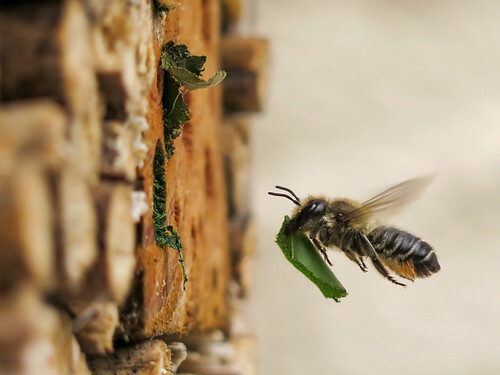 I had made a bee hotel way back in April and this was my favourite resident – a leafcutter bee (probably brown-footed leafcutter) which would spend its days bringing sections of leaf back to seal up egg cells within its nest tubes. I liked the colour scheme of this shot – the carline thistle (in full flower despite the appearances!) 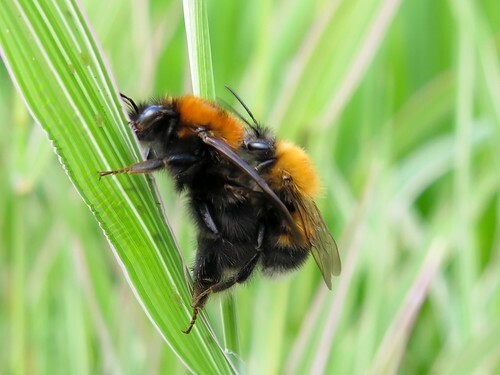 and the carder bumblebee share the same straw-coloured brown which seemed characteristic of the countryside in late summer. 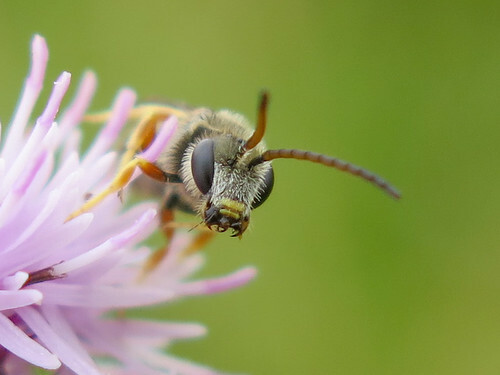 This photograph was taken at Harbury Spoil Banks – a Warwickshire Wildlife Trust reserve. I’m afraid my ID skills aren’t up to this one, but this is one of the small solitary species resting in August. I like the way the thistle flower looks similar to an anemone, reminding me of the clown fish and sea anemone relationship. 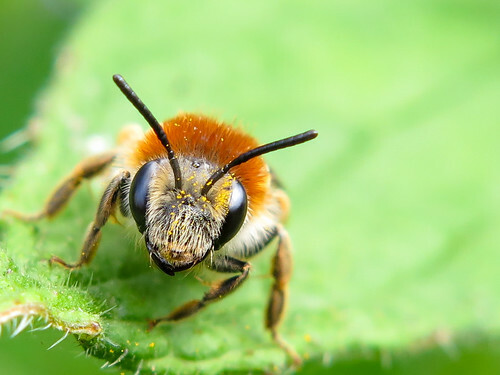 This little bee was actually blowing bubbles into the wind when I found it – a behaviour thought to be useful in reducing the water content of the nectar and increasing its concentration. This was a male heath bumblebee on the heather at Curbar Edge taken just before sunset. This was one of the last bees I saw in 2017, and the first time I have seen this species which is common in heathland areas but can also be found in parks and gardens near to the habitats. I liked the way this one posed at the top of the strand – actually he was trying to be lazy and reach the next flower without taking to the wing! Every week this year, with just one or two exceptions, I’ve taken part in the excellent #wildflowerhour on twitter where people across the UK share their sightings for the week between 8-9pm each Sunday – an excellent way to draw a weekend to a close. Many of these photos made an appearance at some point but this is a run-through a few of my favourite wildflower finds or photos from 2016. The absence of orchids can be explained by a whole post all of their own from earlier this week – take a look here! Tree flowers are some of the first to make their appearance each year and this set shows a few of these in silhouette against a white February sky. The photo on the left is the male catkins of alder whilst the right two images are the female flowers of two different willow species. Many of these early tree species have both male and female flowers. Some, such as the hazel and alder, have both male and female flowers on the same tree. Others, such as these willows, have male trees or female trees which produce just one type of flower. An early-morning walk in May treated me to these frosted flowers in Muston Meadows NNR. The sward was still low, with many of the larger, later meadow species such as salad burnet and meadowsweet still to appear, and these smaller early-summer flowering species were the stars of the show. Clockwise from top left are bulbous buttercup, cuckooflower, green-winged orchid and cowslip. Spring sandwort is a member of the campion family and I came across these cushions of flowers at a disused leadworking site in Derbyshire. It is quite a scarce plant across the UK but frequents these old spoil heaps – such is its connection that leadwort is another name for this flower. I like that this species has specific habitat preferences which are far from the pristine grasslands and woodlands which are associated with the conservation of many species. This is another example of where a closer look rewards the curious – this is a view down the spadix of an arum lily – also known as Lords and Ladies. This reminds me of one of the plasma balls I used to see in Science Museums when I was younger! It would be difficult to exclude bluebells from this selection as the sight of a good bluebell wood, with wood anemone, primrose, violets and yellow archangel mixed in, is one of those sights which is profoundly uplifting after a long winter. Many species begin to flower before these, but the bluebell season marks a threshold between the sparsity of spring and the abundance of summer which is just on the horizon. I like the lightness and delicacy of this shot – taken at the Notts Wildlife Trust site – Treswell Wood. Another photograph from Treswell Wood. I’m not sure I’ve ever seen such an abundance of greater stitchwort than at this site this year – glades were filled with the snow-white flowers of this native woodland specialist. This is another photograph from Muston Meadows NNR – this time at sunset. I liked the moody, hazy feel of this photograph with buttercups and grass flowers against a darkening sky. This set was taken on my birthday this year – we were camping just below Old Sarum outside Salisbury and woke up early to climb the old hillside and watch the sun rise. The fields and landscape below were misty and I liked the contrast of these wildflowers against the sunrise haze.Clockwise from top left is dock, cow parsley, nettle and bulbous buttercup. Smooth tare is a member of the pea family with these tiny white flowers with delicate purple veining. Easily overlooked in a grassland sward, I like the way that they stand out against the soft greens of the surrounding vegetation when you get low enough to appreciate them! I took a treacherous walk up to the Hills and Hollows on the outskirts of Grantham one very stormy lunchtime in June – somehow these ominous heavens never opened but gave a nice opportunity to capture some common wildflowers against a dark sky. Clockwise from top left is white campion, poppy, white clover and hogweed. I have a real soft spot for arable weeds – modern farming works hard to eradicate competition from arable fields but many species still find a way to brighten a dull monoculture. This flax field was quite an amazing sight in itself with its array of ripe seeds, but flecked throughout where the glaucous green and delicate mauve of fumitory which scrambled up and through the crop. Harebells are common in more acidic conditions but can pop up in a variety of habitats. I found them for the first time in the grasslands above Grantham this year, nestled in amongst the Hills and Hollows, but this photo was taken on the Laurie Lee Wildlife Walk in Slad this autumn. You have to get down low to see inside these little flowers, and when i did, I was surprised to find two invertebrate residents settled in for the day. I guess a downwards-facing bell makes perfect cover for a snail to wait until nightfall! The Longshaw Estate in Derbyshire comes brightly to life with the purple wash of heather in August and this photograph was taken on one of my favourite walks which cuts across this land. The bell heather was frequented by the beautiful heather colletes bees which emerge to coincide with this floral abundance each year, feeding on the flowers and making their nest holes in the sandy soils beneath the roots. Another from the Peak District – this time the coconut-scented flowers of gorse against a backdrop of heather. The old saying goes, ‘when gorse is out of flower, kissing is out of fashion’ because you can find this species flowering pretty much anytime throughout the year. There are many fewer pollinators at work during the winter, but when a warm day awakens a hibernating bumblebee, it can be fairly sure of a nectar source amongst a stand of gorse. Whilst I doubt this will be my last wildflower photo of 2016, it seems a nice place to end – a common mallow flower with ice crystals taken on my walk to work in December. A bitterly cold morning, the white edging brought a nice contrast to the deep purple of this flower. Many wildflowers of late-summer will continue flowering until the first hard frosts of winter finish them off so this might perhaps signal the end for this individual! If you are interested in commissioning botanical surveys in the midlands, you can check out Landscape Science Consultancy’s website here! The Botanical Society of the British Isles (BSBI) runs an annual ‘New Years Plant Hunt’ which invites people to record species in flower between 1st and 4th of January. The aim is to find as many species in flower as you can within a 3 hour period. This is partly for fun but will also provide a dataset which could be used to compare trends between years and potentially geographical differences too. My effort was a little poor as I only had a lunch break to hunt in but I managed to find 9 species in flower on the edge of Grantham. Surprisingly, the majority of records were from amenity grassland (lawns) and roadsides rather than the more species rich habitats at the Hills and Hollows to the south-east of the town. All of the species were long-flowering rather than early specialists. A long flowering species can be found throughout the year such as dandelions, daisy and gorse – the old saying goes that ‘when gorse is out of flower, kissing is out of fashion’. 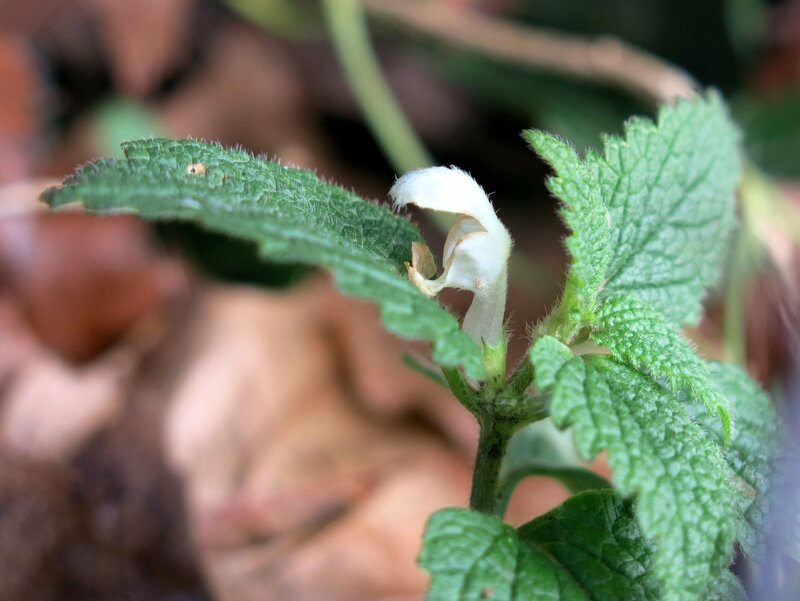 There are a range of species which selectively flower early in the year and can be found flowering as early as January – this includes species such as winter aconite, winter heliotrope and dog’s mercury. None of the species I spotted fell into this category. 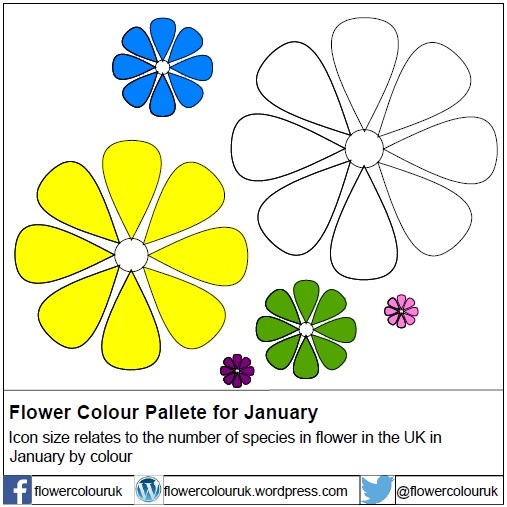 Flower colour is a project I am exploring this year and it seems a good opportunity to consider the distribution of flower colours in January. Three of the species I found were white, four species are yellow, one species is green and one species is blue. This well reflects the colours of January flowers where white and yellow dominate; followed by green and blue; with pink and purple trailing at the back. For more information on this project, follow the Caratinoid&Betalain twitter feed or take a look at the Flower Colour UK blog. 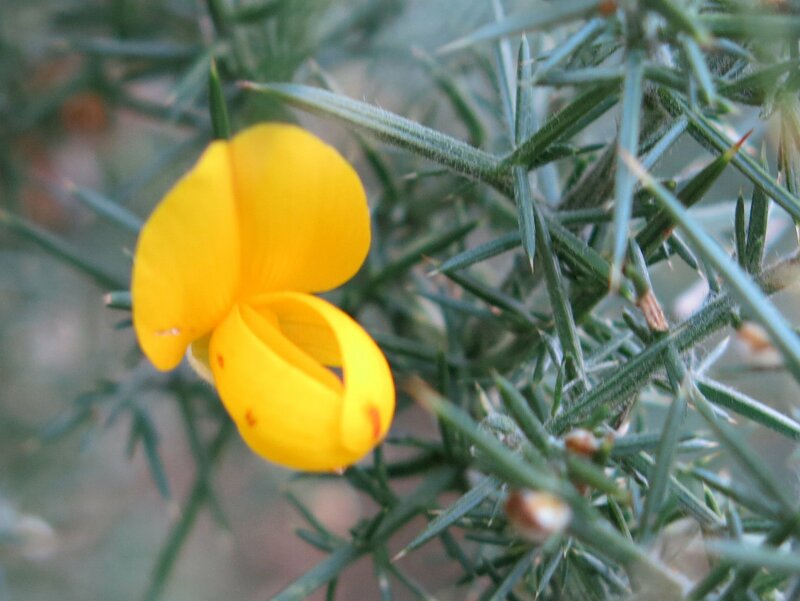 Why does gorse flower in the winter? At this time of year, the world in general (and Grantham in particular) can seem a rather bleak place. Trees are nothing but bare boughs, the grass is wet and sodden underfoot and the only flowers to be seen are those in the supermarket containers or the florists’ window. But there is a notable exception to this general rule. On the south-eastern edge of the town, the fields rise up above the estates at the end of Gorse Road. This area is described as ‘Gorse Lawn’ on the OS map and rises up Hall Hill, on the edge of the Hills and Hollows. Walking over a small stile and scattering rabbits which are nibbling the tips off grass poking above the frost, you are soon surrounded by gorse – latin name Ulex europaeus. Even now, in the middle of January when the bulbs are only beginning to push up through the earth, the gorse growing on this hillside present yellow flowers in abundance. You will almost certainly know gorse, if not by name then by sight. It is one of our prickliest shrubs and grows not only on heaths, where it compliments the purple heather beautifully, but on all kinds of waste ground, flourishing where the soil is shallow and nutrients are scarce. It loves sunny spots and often grows on sandy soils. It is a member of the pea family along with garden peas and beans, garden flowers such as lupins and even trees such as laburnum. The clue is in the lipped, irregular flowers. Perhaps the most interesting question is quite why the gorse is flowering so profusely in the dead of winter. Flowers are clearly designed for greater things than simply decorating our houses, and butterflies and bees aren’t just taking a rest when the alight. 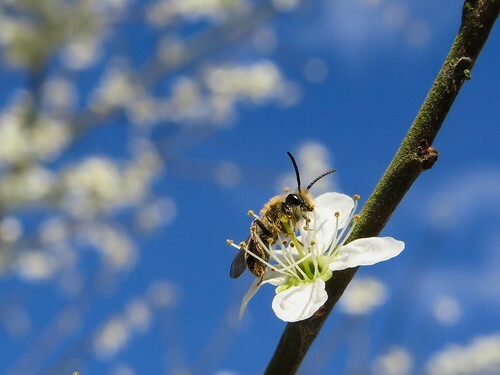 The flowers attract insects through the offer of nectar and use the insects to pass the pollen, from one plant to the next and, so, fertilise them. The flowering season then is designed to coincide with the warmer weather, when most of the insects take to the air. Some plants flower early, some late, some in the middle, but almost none choose to bloom at the one time when insects are in such short supply as mid-winter. So why is the gorse such an exception? A wonderful paper from the Linnean Society journal in November 1869 looked at a number of species which flowered at this most unusual time and concluded that the flowers are all arranged so that they can fertilise themselves without even opening the flowers, thereby ensuring that fertile seeds can be made even if the snow arrives and remains, and if no insects come to call. This ability of gorse to produce lots of clones of itself is part of the reason why it is such an invasive species in countries such as the United States. This ability to reproduce without insects allows the winter flowering strategy without risk of a barren year, and on warm winter’s days when insects emerge, the gorse has very little competition for their attentions as it is one of the very few options on the menu. That goes some way to answering the question of how, but it does still leave the why. Why not? isn’t really a good enough answer. This seems to have received attention from researchers only relatively recently. 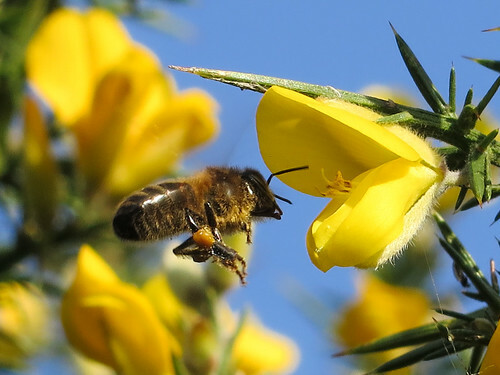 A group of French Researchers identified two main flowering strategies in gorse populations (as there are of course plenty of flowers to be seen in the spring and through the summer too) which seem to reflect two different ways of avoiding losing their seeds to little seed-eating weevils of the Exapion genus. One strategy is to avoid the weevil and, by flowering in the dead of winter in conditions that are too harsh for the weevil, they do just this. Winter flowering specimens tend to produce a smaller number of flowers through a long winter season, so maximising their chances of flowering through a warm spell when pollinators emerge. The other strategy is to produce so many seeds that there are many more than the weevils can consume and this is what the spring flowering shrubs do, producing very large numbers of flowers over a much shorter period. 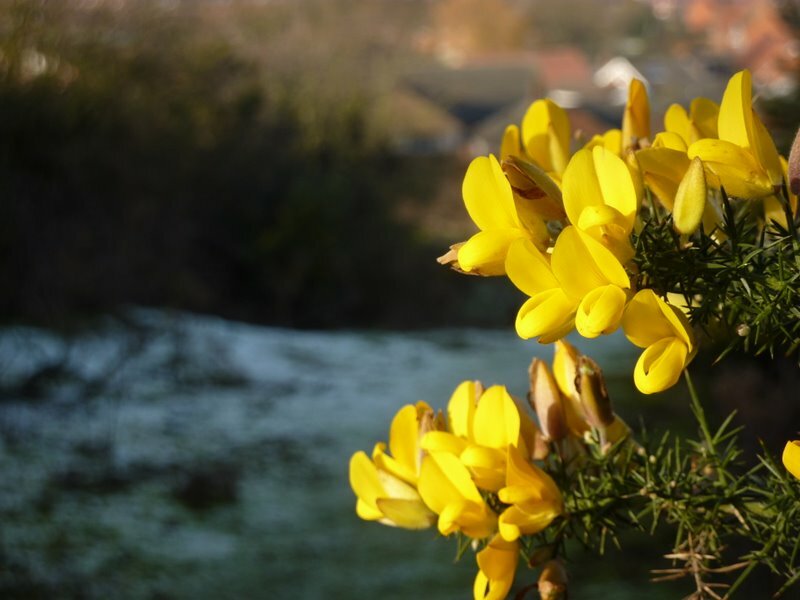 A later paper identified a genetic basis for this – that gorse seeds from a winter flowering specimen tend to produce offspring which do the same. On a more practical note, gorse flowers can be used to make wine and winter may well be the best time to pick them if you want to do this – for the very reasons outlined above, you will spend much less time picking little black insects out of your harvest, although the flavour is less intense than spring and summer flowers! You’ll appreciate the slight reduction in workload though as gathering enough is rather a laborious process and don’t forget the gloves as being prickled by the sharp spines soon gets old. And if wine isn’t to your taste, there are lots of recipe’s for gorse cordial out there too. 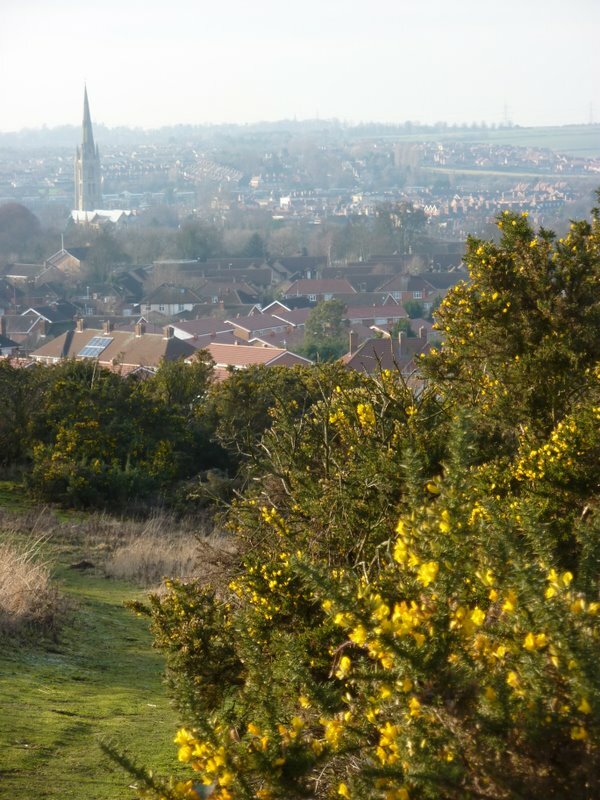 As well as admiring the gorse, a wander up the hill gives you a wonderful opportunity to look down on Grantham, the skyline dominated by St Wulfrums. 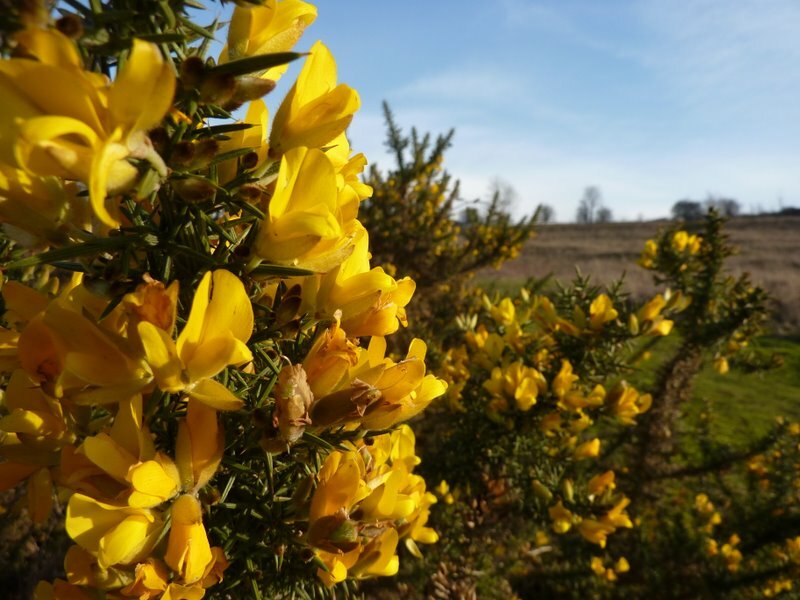 As the weather warms, you’ll be joined by a range of songbirds as the gorse provides a fantastic nesting site with its tangled mass of trunks and branches. And look out for a black rabbit amongst those grazing as you approach!